Samuel F.B. Morse’s invention of the telegraph in 1843 had made nearly instantaneous communication possible across great distances. However, the telegraph still required the manual transfer of messages between telegraph stations and recipients, and only one message could be sent at a time. Bell wanted to improve the situation by creating a “harmonic telegraph,” a device that would be a cross between the telegraph and record player, that would enable individuals to communicate with each other from a distance. Alexander Graham Bell demonstrates the use of the telephone to an audience. The leader of Nazi Germany, Adolf Hitler, violates the Treaty of Versailles by ordering German military forces into the Rhineland, a demilitarized zone along the Rhine River in western Germany. The Treaty of Versailles, signed in 1919 after World War I, dictated that Germany’s military forces were sharply reduced in number, and the Rhineland, a critical industrial area, was to be demilitarized. However. after seizing power in 1933, Hitler repudiated the terms of the treaty, unilaterally cancelling the military terms of the treaty in 1935 and re-militarizing the Rhineland in 1936. German troops marching into the Rhineland. This meeting with Rabin would lead to the Camp David peace talks held between Egyptian President Anwar Sadat and Rabin’s replacement, Menachem Begin, in 1978. During the meeting, Carter attempted to reassure the Israeli prime minister that any Middle East peace talks would be centered on attaining defensible borders for Israel, and would also require that the Palestinian Liberation Organization (PLO) acknowledge the existence of Israel. Although this initial overture was rejected by Rabin, Carter’s sincere friendship with Sadat, and Begin’s receptivity to Carter’s suggestions, moved the talks forward and the fragile Middle East peace process advanced. In 1978, at Carter’s presidential retreat, the president witnessed Begin and Sadat’s signing of the Camp David Peace Accords. President Carter touches glasses with Prime Minister Rabin during the official reception at the White House. As Italian forces in Libya are continuously pushed back by British troops in the North African theatre of the Second World War, Hitler demands that Mussolini, or Il Duce (The Leader) as he is known in Italy, command his troops to resist. However, British troops continue to push westward, even threatening to break into Tunisia, forcing Mussolini to seek assistance from Hitler. Despite Hitler’s reluctant assistance, 20,000 men are killed or wounded and another 130,000 are taken prisoner in three months. A contemporary image of British troops in Libya during the North African Campaign. North Vietnamese Gen. Van Tien Dung leaves for South Vietnam to take charge of communist troops in preparation for a new offensive that will bring an end to the Vietnam War. The North Vietnamese wanted to observe how South Vietnam and the United States would react to a major assault near Saigon, the South Vietnamese capital, as the United States had recently promised to defend South Vietnam against any such attack. Saigon would fall on April 30 that year, marking the conclusion of the Vietnam War. 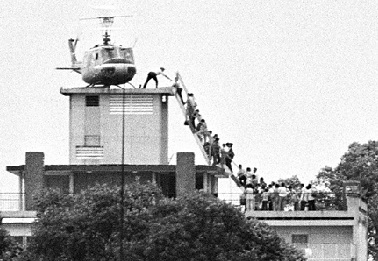 An iconic picture of the frenzied evacuation of the US Embassy in Saigon, shortly before it fell. Noriega, who was the de facto strongman of Panama since 1983, is charged with helping Colombia’s Medellin drug cartel to traffic cocaine and smuggling marijuana into the United States, as well as laundering millions of U.S. dollars. He denies the charges and threatens to expel 10,000 U.S. service personnel and their families who are stationed at the Panama Canal. As tensions continue to mount, the United States invades Panama in 1989, and Noriega is forcefully removed from power. The smoldering ruins of a building during the fall of Panama to US invasion in 1989. A final withdrawal of Soviet troops from Kabul is conducted, marking the end of the decade-long Soviet intervention in Afghanistan, that began barely four years after the United States left Vietnam in defeat. Soviet losses number 13,000 dead and 22,000 wounded, in addition to massive financial costs that could no longer be endured by a state that was on the brink of collapse, suffering from immense social upheaval and economic turmoil. Within three years, the Soviet Union would cease to exist. The last Soviet troops leave Afghanistan. 2002 – Slobodan Milosevic, former president of Yugoslavia, goes on trial at The Hague in the Netherlands. On June 25, 1991, Croatia and Slovenia declared their independence from Yugoslavia and Milosevic sent tanks to the Slovenian border, sparking a brief war that ended in Slovenia’s secession. In Croatia, fighting broke out between Croats and ethnic Serbs. Serbia, the dominant entity in Yugoslavia, aided the Serbian rebels in Croatia. Croatian forces clashed with the Serb-led Yugoslav army troops and their Serb supporters. An estimated 10,000 people were killed before a U.N. cease-fire in January 1992. In March, Bosnia-Herzegovina declared its independence, and Milosevic funded the subsequent Bosnian Serb rebellion, starting a war that killed an estimated 200,000 people, before a U.S.-brokered peace agreement was reached at Dayton, Ohio, in 1995. It was the worst conflict in Europe since the Second World War. A Bosnian special forces soldier returns fire in downtown Sarajevo as he and civilians come under fire from Serbian snipers, on April 6, 1992. 1912 – The last emperor of China, Aisin Gioro Puyi, abdicates. Puyi was enthroned as emperor in 1908 after his uncle, the Guangxu emperor, died. He reigned under a regency and underwent training to prepare him for his coming rule. However, in October 1911, his dynasty fell to Sun Yat-sen’s revolution, and four months later he abdicated. His abdication would mark the end of the Manchu Qing dynasty in China, and the approximately 2000-year-old feudal system of government, signaling the beginning of the modern Republican era in China. After 1925, he lived in Japanese-occupied Tianjin, and in 1932 Japan created the puppet state of Manchukuo in Manchuria under his rule. In 1934, Henry Pu Yi was enthroned as emperor of Manchukuo. Despite guerrilla resistance against his puppet regime, he held the emperor’s title until 1945, when Soviet troops captured him. Puyi’s throne in the Forbidden City in Beijing. On February 12, 1999, the five-week impeachment trial of Bill Clinton ends, with the Senate voting to acquit the president on both articles of impeachment: lying under oath and obstruction of justice. In November 1995, Clinton began an affair with Monica Lewinsky, a 21-year-old unpaid intern. Over the course of a year and a half, the president and Lewinsky had nearly a dozen sexual encounters in the White House. Congress would later approve two articles of impeachment, but the Senate would vote to acquit him of both charges. 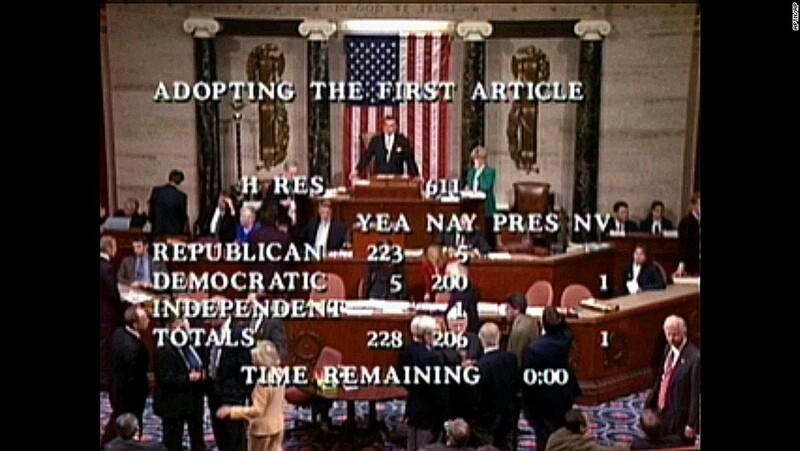 The vote in Congress to determine whether President Clinton should be impeached. George W. Bush, 43rd President of the United States, makes his famous axis of evil speech during his annual State of the Union address, in which he denounces Iran, Iraq, and North Korea as threats to global peace and stability. Iraq would be invaded in 2003 without UN approval, the repercussions of which are still evident even today, in terms of the anarchy in Iraq after the invasion, which created a golden opportunity for the rise of ISIS. Following the death of Mao in 1976, Deng Xiaoping makes his first official visit to the US as paramount leader of China, marking a major shift away from the confrontational relationship of the past under Mao Zedong. His visits to the headquarters Coca-Cola and Boeing indicate the focus on economic technological and development that the new regime will have, paving the way for China’s subsequent breakneck economic growth and rise as an economic colossus in the 21st century. Deng Xiaoping and Jimmy Carter during the signing of a major Sino-American treaty in the United States. Saddam Hussein’s attempt to seize Kuwait in 1990 would result in an armed intervention by an American-led coalition with UN approval, sparking the first Gulf War. This battle would see Iraqi forces driven from the Saudi city of Khafiji, a testament to the importance of American air power in combat, and the weakness of the Iraqi military despite its large numbers. A burnt-out military vehicle in front of the Saudi city of Khafiji after the battle of Khafiji. 2005 the first direct commercial flights between Taiwan and Mainland China since 1949 begin. In the aftermath of the Chinese Civil War that ended in 1949, mutual distrust between the People’s Republic of China and the Republic of China in Taiwan meant that flights between both sides had to be routed towards a third city like Hong Kong. However, warming ties between both sides, and the proposal by the PRC to establish Three Links (postal, transportation and trade), meant that these restrictions were gradually loosened, culminating in the launch of direct commercial flights between Taiwan and Mainland China. An Air China plane lands in Taipei after more than 4 hours of nonstop flight from Beijing January 29, 2005. During the First World War, the British War Office approved a plan to shell the Turkish positions at the Dardanelles, the narrow strait separating Europe from Asia, and the only waterway linking the Mediterranean Sea to the Black Sea. They hoped the initial bombardments would pave the way for British and French forces to march on Istanbul, knock Turkey out of the war and open a path to Russia, which was allied with the British. However, the campaign would end in abject failure, with Allied forces in retreat, having sustained nearly 180,000 casualties. An illustration of the grand scale of the campaign. Following the Japanese bombing of Pearl Harbor, U.S. President Franklin D. Roosevelt signs Executive Order 9066, allowing the removal of any or all people from military areas “as deemed necessary or desirable.” The military then defined the entire West Coast, home to most Americans of Japanese ancestry, as a military area. By June, more than 110,000 Japanese Americans were forcibly relocated to remote internment camps built by the U.S. military around the country. 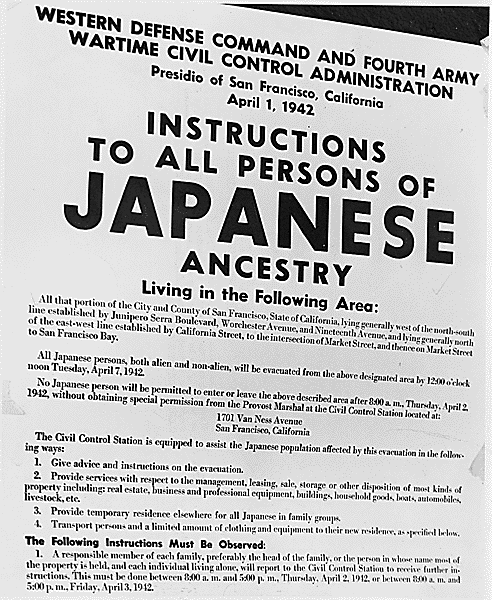 A poster with the wartime instructions for the Japanese American community. On this day, Operation Detachment, the U.S. Marines’ invasion of Iwo Jima, is launched. Iwo Jima was a barren Pacific island guarded by Japanese artillery, but to the US military, it was real estate on which to build airfields where bombing raids against Japan could be launched. Japan was only 660 miles away. This marked the beginning of the final chapter of the Pacific theatre in World War Two, where the fight was taken directly to the Japanese homeland, and which would culminate in the dropping of nuclear bombs on Hiroshima and Nagasaki. US Marines land on Iwo Jima, under the cover of US battleships. In a critical moment for U.S. participation in World War I, President Woodrow Wilson learns of the so-called Zimmermann Telegram, a communique from German Foreign Secretary Arthur Zimmermann to the German ambassador to Mexico suggesting a Mexican-German alliance in the event of war between the U.S. and Germany. In the telegram, intercepted by British intelligence in late January, Zimmermann instructed his ambassador, in the event of a German war with the United States, to offer significant financial aid to Mexico if it entered the conflict as a German ally. Germany also promised to restore to Mexico the lost states of Texas, New Mexico and Arizona. A political cartoon illustrating the German proposal for Americans. On February 26, 1935, Nazi leader Adolf Hitler signs a secret decree authorizing the founding of the Reich Luftwaffe as the air arm of the German military. In the same decree, Hitler appointed Hermann Goering, a German air hero from World War I and high-ranking Nazi, as commander in chief of the newly established German air force. The Versailles Treaty that ended World War I prohibited military aviation in Germany, but a German civilian airline–Lufthansa–was founded in 1926 and provided training for the men who would later become Luftwaffe pilots. The Luftwaffe was to be gradually revealed so as not to alert foreign governments, and the size and composition of Luftwaffe units were to remain covert. Hermann Goering congratulates German pilots who participated in the conquest of Poland. The first South Korean troops arrive in Saigon. Although assigned to non-combat duties, they came under fire on April 3. The South Korean contingent was part of the Free World Military Forces, an effort by President Lyndon B. Johnson to enlist allies for the United States and South Vietnam. By securing support from other nations, Johnson hoped to build an international consensus behind his policies in Vietnam. The effort was also known as the “many flags” program. By the close of 1969, there were over 47,800 Korean soldiers actively involved in combat operations in South Vietnam. Seoul began to withdraw its troops in February 1972. The program was a valuable source of foreign exchange for South Korea, which was then underdeveloped. South Korean troops land at Qui Nhon in Vietnam. A bomb explodes in the parking garage beneath the World Trade Center in New York City on this day in 1993. Six people were killed and 1,000 were injured by the powerful blast, which also caused the evacuation of thousands of people from the Twin Towers. On September 11, 2001, the World Trade Center was again attacked, when terrorists linked to Osama bin Ladin and al-Qaida hijacked and flew one jetliner into each tower. Within hours, both towers had collapsed, killing almost 3,000 people. A third jet was crashed into the Pentagon, killing almost two hundred people, including those on board the plane. The aftermath of the 1993 bombing at the World Trade Centre.